A week ago today my boyfriend broke up with me. It feels like it's at least been two weeks, if not a month--not just one week. Time has no meaning for it. My life has just upended in a way that I never saw coming. In the space of one week I've lost someone I love, or rather it feels like they've set me aside, as if I was unwanted. But I know it's not the whole story. It's very weird. We're still friends, because the only thing that would be worse would be losing his friendship too. We began as friends, and honestly, in a way he is still my best friend. I just want to scream at him and hit him with a bat for being so...cowardly and dishonest for so long. Even though, in a roundabout way, I suppose it was because he loved me as a friend. And I desperately, desperately want him to come back. Whoever said that sticks and stones will break your bones, but words will never hurt you--must never have been in love. Because, like a knife, they can slide beneath your skin, through sinew and bone, through the doorway of your heart into your shattering soul--and all in the force of a lightening strike. That's what it felt like for me. Like my whole being was in the middle of an earthquake. Your soul moves. You can feel it screaming, moving, turning over in the wretchedness that it feels. Part of me wondered something. You hear people say that when you make love, the souls meet. I wondered if it was just a part of his ripping itself back out. But if he never loved me that way, how could that even be. There were moments I could barely breathe. It felt like my soul was being sucked out, forced from my body by some storm. How is it that you can fall for someone that does not feel the same way? And be so blind, to not see it? Perhaps I wanted to just believe, on some intuitive level. I was still new to everything. So was he. But he is a damn fool, in a lot of ways, because we had a wonderful thing going, even just as friends. Plenty of people are not so lucky. I lost my lover, and I'm going to lose my apartment, because it's already rented out. I can't afford that house all by myself. Fortunately my complex offered me another apartment--a bigger, more expensive one, but I think I'll be happier there, even if it stretches my budget. My life has been upended like never before. I'm curious to see where I'll be next year, considering what a wild train this is turning out to be. I want to forgive him. I want to get to the point where I just feel joy at being with my friend again, not hurt and desperately wanting to hold him like I did, or kiss him, or just be allowed to love him. Be held in return. I don't know how long it's going to take. I have really no idea...some days it feels like it will never go away. Other days, I believe it has to. Time changes everything, even if it doesn't erase it. Some days I wonder if I should just walk away, for a time. I don't know. Like I tell everyone, I have my moments. And it's long from over. It's only been a week. It did give me some wisdom though, something I will remember my entire life. 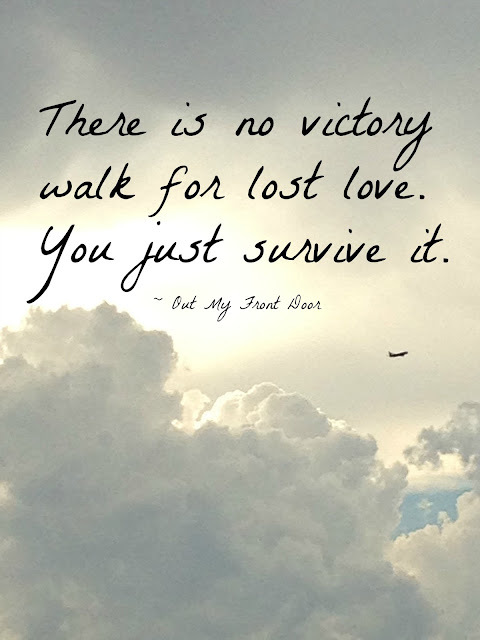 There is no victory walk for lost love. If it was good, even one-sided, you will always mourn it. You don't walk away saying, "His loss, I have better things to do." Because loving him was one of the best things you ever did. But I do have things to do. I have a life to live, and I'm finding a way forward, in the small things. The only victory is surviving it, as you mourn it. And God help me. If you enjoyed this post please comment, and share on social media! To catch more posts, you can subscribe via email, on my sidebar. You can also follow on facebook, twitter, bloglovin, and google+!